This page belongs to the local communities surrounding Clara Bog. Whether you are a local community group, a retirement group, a national or secondary school, heritage group, environmental group, local amenity, a men’s shed, or a sporting organisation, this section of the LIFE site is for you. Bulletins, news, stories, information on events and gatherings as well as local history from the area is currently being compiled by our Public Awareness Manager, Ronan Casey. If you have any interesting stories, photos, information or anything concerning Clara and its environs, please email ronan.casey@ahg.gov.ie or call him on 076 1002627. 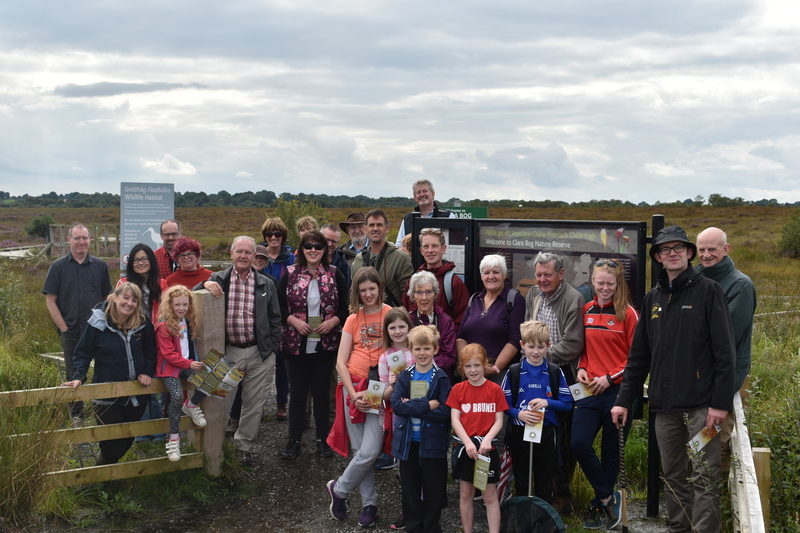 We will also link to interesting people and events in the County Offaly and all other areas surrounding this raised bog. Our events calendar on the main page and on our social media sites (including our FACEBOOK page) is open to the community and reaches a massive audience daily, so let us know if you want to be on it! The Centre was established in 2003 and is funded by the Family Support Agency under the Department of Children and Youth Affairs. It offers a family support service delivered through the ethos of Community Development. The Centre provides a focal point for the community and works towards building the capacity of local people to participate fully in society and to improve people’s quality of life by promoting local awareness, providing information, developing community initiatives and offering support. 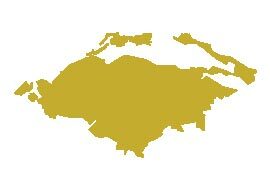 The Centre works to a 3 year Work Plan, developed in consultation with the Community, Voluntary & Statutory Sector. The centre also offers Computer Training Courses, help with Social Welfare and other forms, and an Adult Counselling Service – affordable and confidential bereavement and relationship counselling. Located next door to the Clara Visitor Centre on the Ballycumber Road, Clara library is open to the public all year round, and is a hive of activity daily. Clara Library is located in the same new build as the Clara Bog Visitor Centre, just outside Clara town. The Library is open from 10am – 5pm daily, apart from Wednesdays when it opens late until 8pm and on Saturdays when it opens from 10am – 1pm. Library is closed on Sunday. Clara Library has many regular events, including ‘Tuesday Crafters’, every Tuesday between 10am – noon. The Craft Group meets there every Thursday between 10am – noon and on the first Friday of every month, Clara Book Club meet up between 10:30am – 12:30pm. New members are always welcome to the three events. One of Ireland’s best known markets takes place just outside Clara every Sunday morning. Those with an eye for a bargain will find plenty of opportunity to spot value for money at Clara Sunday Market & Car Boot Sale, which has outdoor and indoor markets selling just about anything and everything. Situated on the Moate Rd outside Clara Co. Offaly on a 6 acre site, just 4km from Junction 6 on the M6, only 15min from Tullamore, 20min from Athlone and 25min from Mullingar. The Market & Car Boot Sale has been trading since 1993. There is a large range of products and services offered at the market. There is food on site and car parking is free. Stall charges apply for those interested in channelling their inner Del Boy to become an independent trader. Your one-stop-shop for all things related to the people of Clara. You will see as you browse through the pages that, for a small town, Clara has a lot to offer and its people are rightly proud of their town. It has a vibrant community spirit with rich and diverse natural habitats. The range of resources and activities available make Clara Town a great place to live, work and visit. Lying at the very centre of Ireland, halfway between Dublin and Galway, Clara makes a central base from which to explore the country. 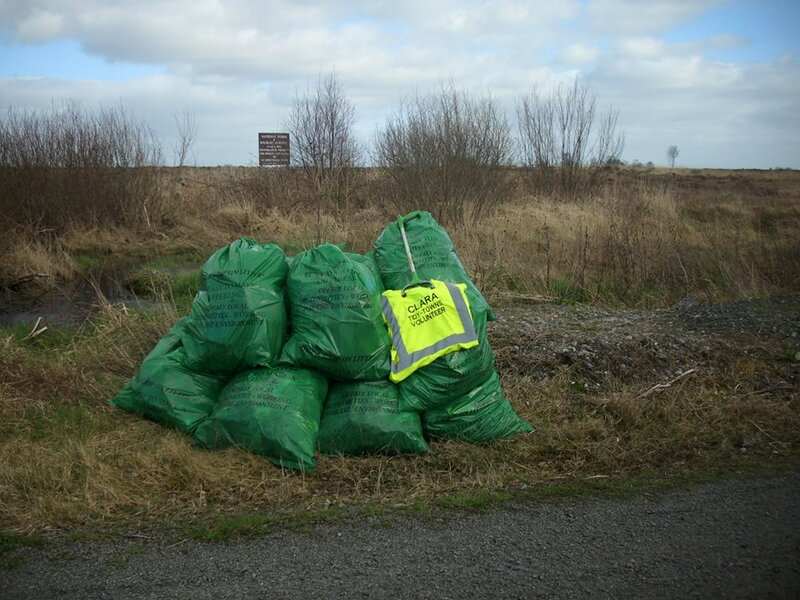 One of the most active and busiest Tiday Towns groups in the country, doing their best to improve the town for all those who live in it and the many thousands who visit every year. Please contact Tim McMahon for further information, 085 174 0453 or e-mail claraactionplan@gmail.com or Visit its Facebook page for more info on their activities in keeping Clara beautiful. Clara Musical Society has received various nominations and awards in the annual Association of Irish Musical Society (AIMS) Awards ceremony over the years including 7 Nominations and 3 Awards for Beauty & the Beast in 2010. 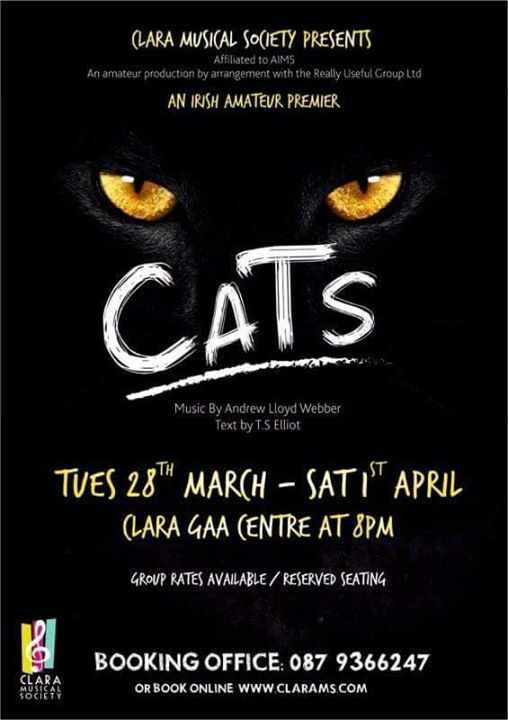 Between March 28 – April 1 of this year they are presenting the Irish amateur premiere of ‘CATS’ at Clara GAA Centre. 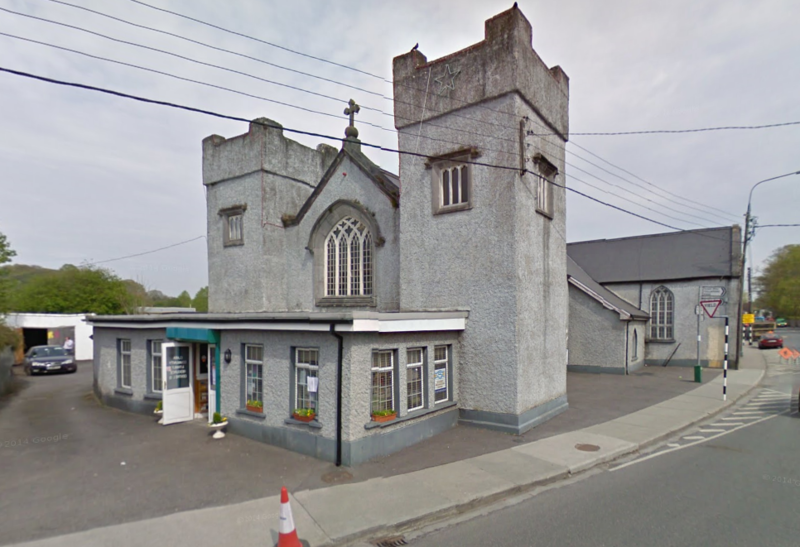 New members over 16 years of age always welcome to the rehearsal rooms at the Friends Meeting House on the Tullamore Road. Visit their Website or Facebook page. Clara Town Band are favourites on the Irish marching band scene. 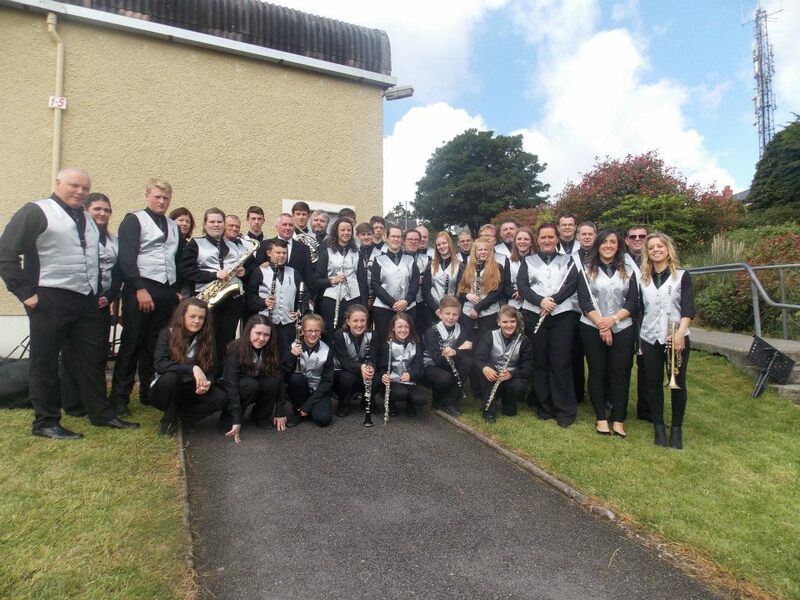 In 2014, Clara town competed in the National Band Championships and were awarded Overall Winners of section 4, the Best Show Piece, Best Programme Choice followed by Most Promising Band. In 2015 they were Intermediate Section Winners in the South of Ireland Band Championships, and they were second place in the Nationals in 2016. For information about Clara Town Band please contact Marian 087 150 6678, claratownband@gmail.com or visit their Facebook page. The award-winning Clara Town Band pictured in 2015. Clara Playground Committee Clara Community Playground is a wonderful facility for everyone in Clara to enjoy. 2nd Offaly Clara Scouts Scouts have been active in Clara since 1969, when a branch of the Catholic Boy Scouts of Ireland (as it was then known) was officially opened in January 1969. Summercamp Clara Family Resource Centre run Youth Summer Festivals each year.